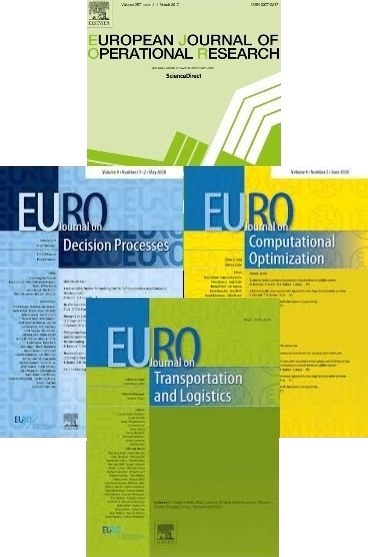 The EURO Journals EURO Journal on Computational Optimization (EJCO), EURO Journal on Decision Processes (EDDP) and EURO Journal on Transportation and Logistics (EJTL) are official publications of EURO, the Association of European Operational Research Societies. These EURO journals are currently published by Springer and EURO maintains up-to-date information on the journals on its website. The EURO Executive Committee (EC) identifies a member of the EURO EC as responsible for all EURO publications. Each EURO journal will consist of an Editor-in-Chief (EIC), an Editorial Manager (EM), a set of Editors, and an Editorial Board. Volunteer reviewers will be selected as appropriate. The Editor-in-Chief (EIC) is responsible for all activities of the journal. He/she interacts with the EURO EC member responsible for publications as appropriate and with the publisher for all matters concerning publication of the journal. The EIC will receive an annual budget determined by the EURO EC. The EIC is appointed by the EURO EC. Any candidate for EIC must be a leading and experienced researcher in the area of the journal. The EIC will be appointed for a period of 3 years and this appointment can be renewed at most once. In exceptional circumstances the EC may terminate this agreement before the end of a term and appoint a replacement. The EIC may include Special Issues for which Guest Editors will be selected as appropriate. In particular, there may be opportunities to consider Special Issues relating to EURO-k conferences, but the EIC has the final decision regarding whether to publish a Special Issue and for ensuring that any Special Issue maintains the high quality of publication of the journal. An Editorial Manager (EM) may be appointed by the EIC to support his/her operational activities. The EM does not have any responsibilities concerning the editorial policy of the journal. The Editors have an active and continuous role in assisting the EIC in the core activities of the journal, such as the reviewing process of the submitted papers, proposals for special issues, and interaction with the EIC on editorial policy. The initial set of Editors is proposed by the EIC to the EURO EC for approval. The set should consist of top quality researchers in the area of the journal and should provide adequate coverage of the topics as well as reasonable geographical and gender representation. There is no standard term for Editors but typically their term of office is co-terminus with that of the EIC. The EIC may suggest changes to the EURO EC member responsible for publications. Where the EURO EC member responsible for publications agrees to a change in the set of Editors, this will be implemented and the EURO EC will be informed at the subsequent EC meeting. The members of the Editorial Board support the EIC as editors of submitted papers. In addition they promote the journal and may be consulted on other matters relating to the journal as appropriate. The initial Editorial Board is proposed by the EIC to the EURO EC for approval. The Board should consist of top quality researchers in the area of the journal and should provide adequate coverage of the topics as well as reasonable geographical and gender representation. The EIC may suggest changes to the EURO EC member responsible for publications. Where the EURO EC member responsible for publications agrees to a change in the Editorial Board, this will be implemented and the EURO EC will be informed at the subsequent EC meeting. Papers must be submitted online and in English and according to the Instructions for Authors provided. Submissions are initially checked for suitability by the EIC. The EIC may reject a paper or delegate authority to an Editor or member of the Editorial Board (in this section both will be referred to as ‘Editor’) in respect of reviewing papers. The Editor will evaluate the quality of the paper and may decide to immediately reject it. If the quality is adequate, the Editor sends the paper for review. EURO journal submissions are single blind reviewed and reviewers are sent a copy of the submitted paper in the appropriate format. All papers must be reviewed and returned to the Editor within a reasonable time period. The Editor will forward a recommendation on paper quality to the Editor-in-Chief soon after receiving the recommendations from the reviewers. The decision on the paper will be: reject; reject with invitation to resubmit; major revision; minor revision; accept with no revision. The Editor aims to make a decision on a paper or a revision within three months of its original submission. The EIC communicates the decision to the corresponding author of the paper and the decision is also reported to the reviewers. On behalf of the EURO Executive Committee January 2012.